Holcombe comes across as more upbeat, but no less intense. Plenty of singers sound like they've followed a lifelong regimen of whiskey and cigarettes, but sometimes you wonder if they aren't putting on a bit of an act. Not so with Malcolm Holcombe. By the time he's done singing, growling, and rasping his way through a song, you can just tell: that voice isn't merely lived in; it might have even been to the edge. His own bio even goes so far as to mention the belief among fans that they'd soon be talking about Holcombe in the past tense. Luckily, that hasn't been the case. Holcombe's traveled a long road since his debut record was inexplicably shelved by Geffen Records, releasing eight (as of To Drink the Rain) increasingly accomplished albums. Whatever demons Holcombe's fought over the years, though, he seems to be past them now. 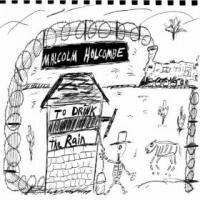 Perhaps as a result, To Drink the Rain might be the most upbeat record of Holcombe's career. He's still intense -- even shuffling album opener "One Leg At a Time", with its gritty homespun humor, sounds like hard-won wisdom. "Mountains of Home" is wistful, tender, and emotional. At first blush, Holcombe still seems like a force of nature, but not the singer who always sounded like he was on the verge of crushing his acoustic guitar in his hands as he played. It's not long, though, before he's growling through the protest song "Behind the Number One" ("There's a land o' milk and honey / Full o' lawsuits left and right / Keeps me jumpin' in the water / Drownin' demons in the night"), and the title track is one of Holcombe's finest examples of his gutbucket blues style to date. To Drink the Rain, though, leaves the listener with the impression that it's a gentle record, represented more by pastoral moments like "Down in the Woods" ("Way down in the woods / Touchin' moss so soft / On the deadwood dyin' / In time's fertile arms") than aggression. Characterized by a full-bodied country-blues feel (aided in no small part by the work of folks like Luke Bulla on fiddle, Dave Roe on upright bass, and Jared Tyler on dobro and acoustic slide), To Drink the Rain is easily on a par with Holcombe's most recent -- and arguably some of his best -- work. What's more, it casts a spotlight on the more subtle aspects of Holcombe's songwriting that often go unnoticed. I live near Holcombe's stomping grounds, and there are plenty of tales of him scaring the bejeezus out of genteel arts festival crowds. As primal as Holcombe can come across on disc, he's even more visceral on-stage, so it's even more impressive that To Drink the Rain can capture those aspects of Holcombe's music that initially seem at odds with one another.